I’ve been reading coverage of the United Church of Canada’s decisive vote to pull the plug on proposals for church-wide divestment and boycott of Israel, as well as church rejection of some of the wild, conspiratorial materials anti-Israel activists within the church were using in their campaign to delegitimize the Jewish state. I have to admit that, despite a few forays into British anti-boycott activities via some work with the UK group Engage, most of my anti-divestment activities has been US based, meaning I haven’t had much direct contact with what’s been going on in Canada. That said, Canadian institutions (including the United Church of Canada) are frequently put forward by divestment activists around the world as examples that should be followed, giving this week’s UCC rejection of the boycott weapon international significance. But it was the commentary around the vote that got my attention, the story of a church that is both declining and aging, a denomination that once constituted a quarter of Canadians, now representing less than 10%. Like Mainline Protestant churches in the US (such as the Methodists, Presbyterians and Episcopalians) facing similar declines, the UCC has been reducing the role of religious doctrine in the lives of its members in hope that being more inclusive (coupled with some TV advertising) will increase membership. And if this has created a vacuum regarding the role of a church where religious observance (or even belief) is optional, that space has filling up with secular politics (traveling under various appealing sounding, but intentionally vague brands such as “social justice” or “international law”). If this swapping of a certain amount of spiritual for secular activity (i.e., finding a new balance between God and Caesar) was showing results in the form of a growing membership in the church, one could make a case for the success of this strategy. But apparently, continued declines in church membership has only triggered questions of how fast to double down on a strategy that has served these institutions so poorly for the last four decades. This whole issue would hardly be here or there for those of us who are not members of a declining Protestant church. After all, what they do with their doctrine is decidedly their own business. But once secular politics became the spiritual mission for key church constituencies, suddenly people who differ with endorsed church policies found themselves arguing not secular politics, but (apparently) politics endorsed by the Deity. Nowhere is the gap between lofty spiritual rhetoric and grubby human politics more apparent than in the way church policy regarding the Arab-Israeli conflict is formed. As with most divestment movements, a small, energized and highly-vocal minority make it clear to their co-religionists that they have one and only one moral choice on this issue (i.e., Israel is guilty as charged). Information that would contradict this conclusion is forbidden from the discussion. Parliamentary maneuvering is used to keep voices objecting to church anti-Israel policies off the stage. And when, despite all this manipulation, divestment motions fail (since church members have long indicated they hate these policies), the voice of this majority is ignored (or at least put aside for two years when new anti-Israeli resolutions can be put forward in hope of getting members to vote “the right way” for once). A few months back, the synagogue I recently joined announced policies regarding the mechanism that would be followed for the Temple to take an official stand on a political issue. “Oh, crap!” I thought, knowing what I know of what became of so many Mainline Protestant churches who thought they were doing good by embracing the issues of the day, but quickly found themselves manipulated and exploited by ruthless divestment activists. To my delight, the policies that were introduced were extremely stringent and methodical, allowing for several layers of decision making (while also allowing some flexibility for emergency situations, or the special role of clergy). Without dwelling on details, these rules recognized that the synagogue is an institution made up of members whose opinions deserve to be taken into account, that it is an institution that has been around for 50 years, meaning its reputation and moral authority rests on the work of countless people who may no longer be around to speak. And, like the Christian churches, this authority rests of millennia of effort and history that has come before any of us were born. In short, taking a stand on an issue of the day “in the name of the church/synagogue” is NOT TO BE TAKEN LIGHTLY!!!!! And, by “lightly” I’m not just talking about taking stands on frivolous matters, or on issues around which everyone already agrees. Taking decisive stands on critical issues (such as the Middle East conflict) is also frivolous if those positions are decided by tiny minorities who may speak only for themselves. It is frivolous if decisions are proposed based on moral blackmail or based on manipulating and/or ignoring the opinions of church members IN WHOSE NAME DIVESTMENT ACTIVISTS ARE CLAIMING TO SPEAK. 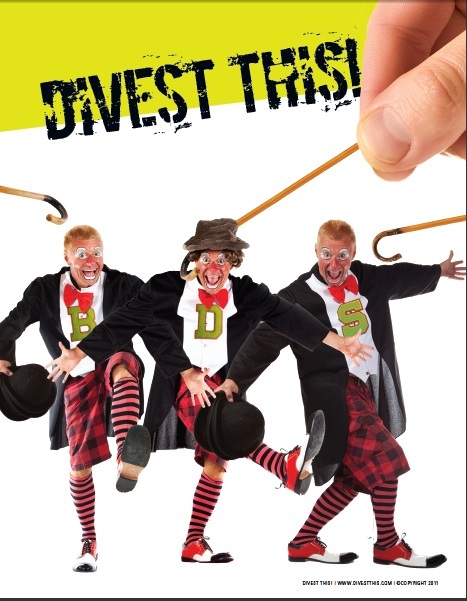 Divestment activists, of course, want their message to be amplified by making it the word of the United Church of Canada, the Presbyterian or Methodist Church because then they are one step away from declaring their “Israel=Apartheid” message as being the word of God himself. It’s clear what’s in it for them. But the question remains, especially for church leaders continually manipulated by divestment advocates while ignored members who protest or leave in disgust: what is in it for the Churches beyond divisiveness, misery and continued decline?